Legal marketing tactics – will anyone in the Uk try some of the US tactcs ? There can be little doubt that the legal profession is in the midst of unprecedented change and the inherent difficulties facing solicitors are not helped by the fact it remains very difficult for lawyers to walk the tightrope between being a business and professional regulation. In a marketplace which was already crowded by the surge over the last 20 years in qualified solicitors and the new threats faced by large retailers, banks and others entering the market, outside of a clear niche, it can be very difficult for lawyers to differentiate themselves and marketing has moved up the agenda of almost every law firm, large or small. So, what constitutes good marketing and what may constitute marketing which may be considered unprofessional ? In our view, it’s certainly true to say that good marketing is doing something which is radically different to industry peers and perhaps even shocking, especially in a world where we are subjected to a bombardment of competing claims for our attention via tv, the internet and everywhere we look. We are not qualified to comment on whether professional regulation in the US or in specific states in the US is considerably more lenient than in the UK and it may be that some of the advertising tactics used by lawyers in the US would not fall foul of Law Society regulation here either, but some forms of advertising we recently came across from the US seem to be far more radical than anything we have seen here. Typically, the more “aggressive” or “out there” tactics apply to personal injury, but there are other areas of law where the message is pretty stark. 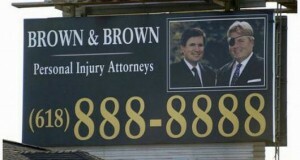 The message here appears to be – we are empathetic lawyers. If the guy on the right doesn’t have an eye problem, could this be misrepresentation ? Maybe the above is a firm of the well know tactic known as guerilla marketing ….. ? 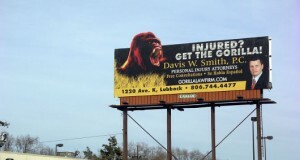 As legal marketeers ourselves we have some residual admiration for the creative thinking in the above examples but as against that, even we, when asking ourselves would this sort of marketing work on us if we were injured and needed a lawyer, tend to think not. Maybe that makes us poor marketeers or maybe the US market is different ? What do you think ? Evolved Legal works with a select group of UK law firms including Gannons Solicitors.